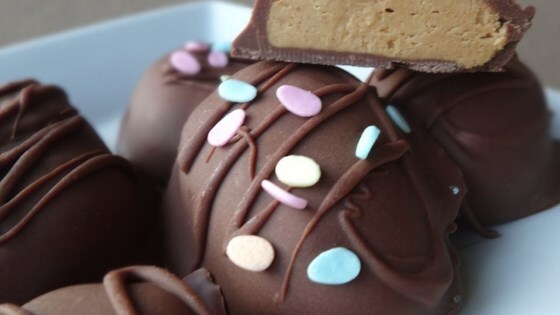 "My Mom made these chocolate-dipped peanut butter eggs for many years. She would put our names on them in frosting and decorate with bunnies and flowers. They bring back wonderful memories." In a mixing bowl, combine confectioners' sugar, peanut butter, butter and milk (if needed for moisture) until blended. Shape mixture into two 1/2 pound eggs or make a bunch of smaller eggs. Freeze eggs for 1 hour. While the eggs are freezing, cut semi-sweet chocolate into small pieces and place in top of double boiler with shortening. Melt over medium heat, stirring frequently until smooth. Stick a long-tined fork in top of each peanut butter egg, dip it in melted chocolate to cover then drain on waxed paper. When the eggs are cooled and set, decorate the eggs to suit your fancy.